"I was both disappointed and excited to hear a report of your voyage on my local public radio station in east Tennessee this evening. Excited because it's great to see like minded people demonstrating the potential of alternative energy, and disappointed because we've been working two years on making the same voyage you are doing and you've beat us to it. "I suppose at least we'll be able to claim our boat is recycled! I'm refitting a 30-year-old, bilge keel concrete boat that I saved from destruction about four years ago. 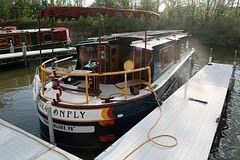 We hope to equip it with a solar-electric drive and cruise the Great Loop, promoting alternative energy. "I'm a mechanical engineer who has worked on various solar energy applications for almost 30 years. My specialty has been solar thermal, and I'm currently working on developing a solar refrigeration system for homes, as well as an innovative approach to commercial scale solar water heating. "Refrigeration alone accounts for nearly 10 percent of the electricity consumed in the residential sector, and water heating accounts for almost 20 percent. We've had fully developed technologies to displace all that consumption for decades, yet they're not widely used. "I think that any meaningful solution to our energy and environmental challenges will need to be applied from the bottom up, and not the top down. I have been a strong advocate for the development of a decentralized energy infrastructure--where every home applies load- specific alternative energy technology such as solar water heating, refrigeration, air conditioning, and heating--rather than setting up “solar farms” with acres of solar panels that continue to feed our current inefficient energy distribution system." "I'm not sure yet if news of your voyage has inspired or discouraged me. (Inspired, we hope!) Unfortunately, we won't be getting under way for at least another year or two. I've been working on the refit design and collecting some of the parts and pieces we'll need while saving money for the refit. We hope to begin in earnest down in Fort Myers, Florida, this winter." Thanks, Carter, and good luck. 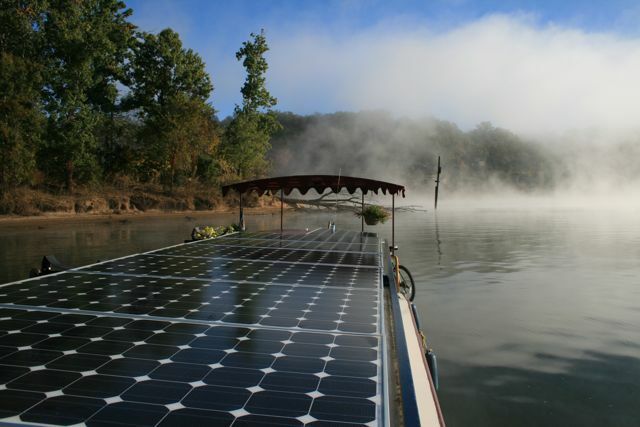 Any other solar boaters want to tell their story?